Welcome back to the second half of our anatomy lesson. Today all the fun stuff happens - we'll be turning fiber into yarn through a few simple steps. To answer a couple of questions from last time, I spin with a Kromski Minstrel, (you'll see it in today's pictures) and yes, I love my wheel. It's an upright double treadle that is compact enough to fit into small apartments without being cumbersome and is an aesthetically pleasing piece aside from its upstanding functionality. Both big priorities in my book. Now, lets do some spinning, shall we? 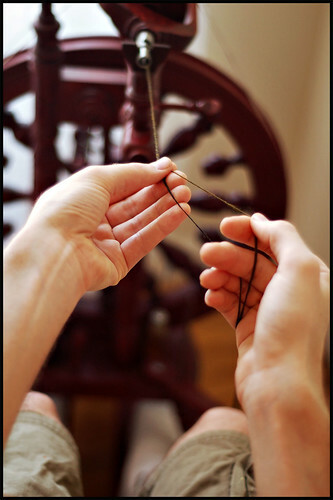 Spinning is essentially putting twist into loose fibers to hold them together into a strong, continuous string or thread. Twist is, in fact, the very essence of spinning and mastering control over the amount of twist you choose to use will dramatically change your resulting yarn. Hard, durable yarns have lots of twist and are favored by weavers and rug makers for their ability to take hard knocks and stay intact. 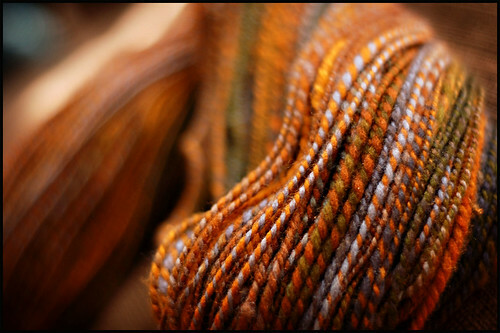 For handknitters, lighter, lofty yarns are often preferable and are less tightly spun. Of course this is an over-simplification, but you get the idea. I'll be spinning a 2-ply yarn today, and the first step in the process is to spin singles (single plies of fiber). These spun fibers will then be plied together for the finished product. 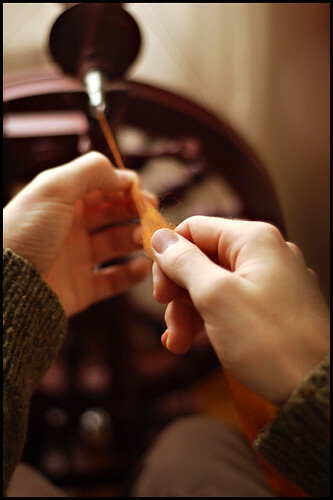 An important rule when plying: the direction of your twist in the singles must always be reversed when plying - thus equalizing the tension put on the fibers and forming a balanced yarn. I like to think of twist as dormant energy - if you put too much into your singles and don't compensate for it while plying, one throws the other off balance. Above we have two bobbins of singles in more or less equal amounts. Before spinning I made sure to divide the fiber evenly into two parts in hopes of maximizing the yardage of the finished, plied yarn. You can see clearly on the bobbins how cleanly separated the color fields have spun out. If we were to knit this yarn up as-is, we would see clean, dramatic color stripes in our finished fabric. Plying them together, however, will essentially have the effect of mixing paint - the colors will come together somewhat randomly to diffuse or enhance one another, depending on their individual combinations. This is to me one of the best things about spinning plied yarns from hand-dyed fibers. 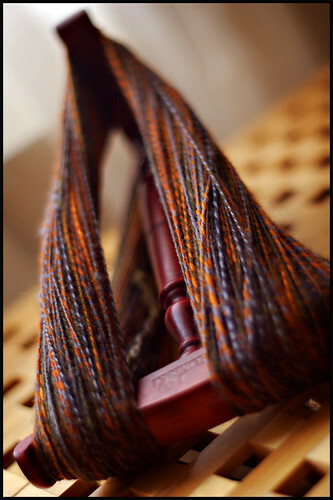 Before plying, I like to load my bobbins on a tensioned Lazy Kate, for ease and consistency of flow while plying. A Kate isn't absolutely necessary for plying yarns but I find it makes the job a whole lot easier and more enjoyable. Plying is enjoyable and seems almost too easy in comparison to spinning singles - in a way the plies actually want to come together and relax as the tension of their twist is balanced. The amount of twist added while plying should more or less correspond to that in your singles, as I mentioned before, to achieve a no-fuss yarn. With one hand pinching the yarn, I use another to separate and guide the plies as they flow off of the Kate. Plying can be rather hypnotic, not only as you watch colors combine and flow but also from the constant whirring of the wheel and mindless peddling of your feet. Very relaxing. Just don't do it while your cooking something on the stove. Seriously. Before you know it, you'll have a nice, full bobbin of 2-ply yarn waiting patiently to come off the bobbin. Now the spinning is done, but don't forget that "finishing" your yarn is an equally important (and enjoyable) part of the process that I shant forget to mention. 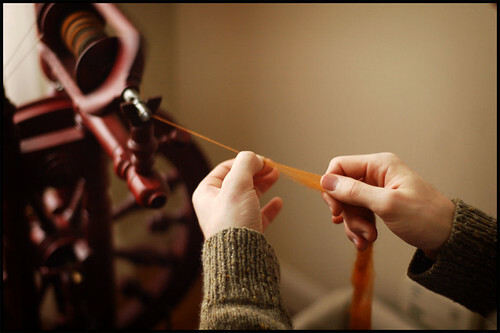 Using a niddy-noddy, the back of a chair, or any other surface you can think to string yarn around, gently skein your yarn off of the bobbin in preparation for its inaugural bath. Washing handspun yarn is essential because it sets the twist, allowing the fiber to relax and adapt to its new configuration. Washing is also wonderful because, much like blocking your knitting, it will often erase or at least de-emphasizes mistakes, snags or tension issues. When taking it out of the bath, it's also a good idea to give it a few good *whacks* against the tub to even things out. Especially for beginners, skeins straight off the wheel may be far from balanced, but giving the yarn a bath will work wonders as a self-esteem booster. I've had particularly ugly yarns come out of the sink looking well-behaved and beautiful. Another of wool's many wonders. Wash your yarn like you wash your sweaters - gentle soap, luke warm water, no agitation - squeeze out excess water and hang up to air dry. Weighting the bottom of the skein as it dries also works great for helping to balance your yarn. When everything is dry, you can go nuts. Petting, smelling and general merry-making are all now acceptable activities for which to engage with your yarn. Whether or not knitting happens, no worry, handspun is beautiful as a stand-alone, boasting enough aesthetic prowess to hold it's own just about anywhere in the house. And that, my friends, about sums up this fast and loose version of handspinning a 2-ply yarn. This is just one of the many ways you can use a spinning wheel to make yarn, though. The possibilities are truly endless and if you really love having your hands on fiber, you probably won't ever tire of spinning. I intend on covering a third portion of this series talking briefly about knitting with handspun and planning projects, but probably not immediately. My knitting time has been fruitful and inspiring lately (I have much to show you), and I don't have anything immediately in mind for my most recent batch of handspun. When I do, though, we'll talk more about knitting with handspun yarn. I do hope everyone is enjoying the sun, it's been gorgeous around here - my spinning wheel loves all the open windows. Happy spinning! thanks for sharing the process and the why's behind it. I am trying to avoid spinning for the time being, but it is great to learn about it, all the same. And seeing the yarn is always a treat. thanks, again Jared! I love checking in with The Tweed. These posts are awesome and the yarn just gorgeous. Beautiful picture tutorial. But you don't thwap the heck outta the yarn after it's been soaked? In my experience, it really helps distribute the twist and balance the finished yarn. This makes me want to put the needles down again and get back on the treadles. Why does it seem that there is only time for one obsession at a time in my life? Thanks for the lovely pictures, as usual. What a lovely coincidence; a friend loaned me her wheel for the weekend, and I spun up my first skein in 17 years after church today. I'll wash it tomorrow; tonight I'm happily all. spun. out. I really enjoyed this, because I just started spinning a week and a half ago! Granted, it's taking me forever because I'm using a drop spindle, but I still love it! Ah, timely. I just spun my first ever (well, since I was nine years old) handspun and while it's terrible, it's mine! Thanks for your beautiful photographs and inspiration. Great tutorials! You make everything look so easy. Exactly how spinning is after getting over those first skeins of nervous breakdowns. Cool, I'd like to learn it ! Wonderful information. Beautiful photos as always. Thank you for taking this to a level I can appreciate. You make it look so easy - practice, practice, practice and now I am getting better. Great tutorial. Thanks! Much appreciated. As a new spinner, I do have a question, I wash my handspun and then whack it to distribute the plying a little. This seems to help even out any issues.. Is this not what you do? Great Post. Can't wait to see your next installment. The pictures are inspirational. Lovely, lovely yarn. Now I'm feeling the urge to go dig out my wheel and some wool and spin again. If only I can figure out how to keep the boy cat from "helping." One other benefit to plying and washing - uneven spinning (slightly thick and thin) often evens out beautifully in the process. I spun a gorgeous mix of wool, mohair and silk up into somewhat pathetic singles, but the finished yarn is completely usable and looks great (as long as you don't peer too closely at it). Thanks for these posts! They were interesting, beautiful and informative! Cant wait to see what projects you've been working on. I'm very close to finishing my Koolhas. It should happen tonight. I'm very excited! This is very inspirational... 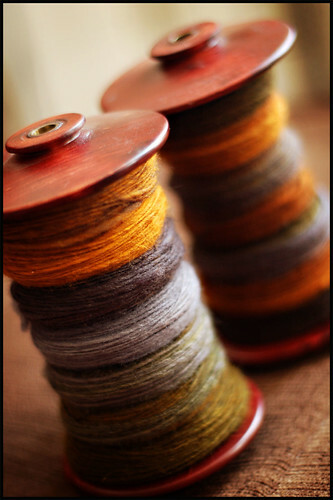 I am starting a spinning class (spindle) in May - just an introduction really and I can't hardly wait. Now I'm soooo tempted to start spinning. Luscious photos. Great Post! I too am a Kromski fan and own both a Mazurka and a Sonata. The Kromskis make, in my opinion, the most beautiful wheels on the market, PLUS they are superb peices of machinery. I recently moved the Mazurka from the front room to the den/media room and my husband complained because the wheel looked so good sitting beside the hearth. I love having my wheels, roving and homespun sitting out in my handmade baskets. Visitors enjoy looking and touching. Right now I have some gorgous Jacob homespun in a rivercane basket I made in a Cherokee Basketry workshop. Thanks for your posts. I've only spun on a drop spindle. I set the twist on my plies by holding it over hot, steaming water (I use my tea kettle). I've never tried washing it. Any pros or cons on the methods? this is a really good quick tutorial for learning how to handspin. i'm especially gonna make sure i get my fiber stash down just to use as decoration until i knit it lol. You have given me something else to learn how to do....bravo! and thank you for posting what sort of wheel you have! I'll add it to the list of possibles for my future wheel purchase. Right now I'm working off of drop spindles. I too am enjoying this series. Would you consider writing about common beginner problems or tips to work through common road blocks when learning? I love the colors of the roving you use. Do you always separate your roving when you start into two separate amounts for ease in plying? Or can you make a 2-ply from a single bobbin? I live in France and I like very much your blog, pictures are so beautiful and your knits are wonderful. I spin for a year now (Louet S10) and would like to change for a new wheel. The minstrel is tempting me very much. Are you happy with it ? And what is the color you chose, it's really nice. Thanks for the overview -- spinning is my future heart's desire. You answered some questions for me about twist and plying. Thanks for that and the lovely photos!!! A great post on spinning! Love the way your yarn turned out when all was said done too! I can't wait to see what your gorgeous yarn transforms into. You've started me on an exploration of yarns...finding the indi-spinner and buying it up. I'm not at the point of spinning my own but releshing in the creations made by others. Thank you for another amazing post. Thank you so much. You've given us a clear understanding of this process, and that's just what we need! thanks! I just bought a spindle and some top last Saturday, and now I can envision what it might become! Thank you SOO much for the tutorial! It's like you were reading my mind as I have been spinning and have had questions that you have helped answer. I'm not sure how much twist to put into the singles but I guess I'll just have to just learn as I go. I'm immensely envious of you and your abilities, Jared. You make the most beautiful things, even when it's only yarn. Thank you for sharing this with us, you're an inspiration. Thanks for the lesson, I really needed one ! oh my. never really caught the spinning bug but now... i may have to add a new obsession to my already obsession filled life :) beautiful pictures as always. Jared, what a great mini tutorial you've put together. I only have one comment. 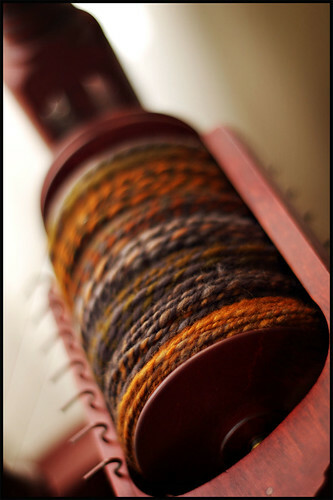 When I first started spinning I would weight my yarn while it dried to "balance" it as it were. However as I learned more about spinning I was told not to weight the yarn because it removes the elasticity which is something needed for knitting (I was told weighted yarns are good for weaving with) and that all the good I do by weighting the yarn will be undone as soon as it hits water again (in the blocking process after knitting.) Just thought I'd share. Your photographs make me want to go home "sick" and break out my wheel. Usually when I read an article or post on spinning, my eyes begin to glaze over like they do when sports comes on the 11 o'clock news. But I enjoyed your tutorial very much and of course your photographs beautiful, as usual. Thanks for sharing this with us. I love your photos. There is a continual calmness that comes through your images. I would look at your blog even if there was no text--just for the pictures. Thank-you for such a wonderful visual spinning narrative. i love your photos and the color you get is amazing! Thank you so much for your always thoughtful and thorough analyses. You are a true favorite of mine! Jared, I really want to know if there is anything you do fiber-related that doesn't make us all want to jump right up and go buy a gorgeous spinning wheel/yarn/pattern. You are such an inspiration, I hope I can achieve making such lovely yarns someday. Don't forget to tie your skein in several places before slipping it off the niddy-noddy and into its bath. The tangles that result are not fun. Nice tutorial! One of these days I'll have to try spinning and you have just reminded me of that desire. Thanks for the lesson! beautiful wool, the colours look so warm together. The warmth in these photographs reflects the calm, happy activity of spinning so well, I feel like leaving my work desk right now and taking the first subway home to go sit at my wheel! I love the Kromski Minstrel, that's one fine looking piece of machinery! Your wheel is beautiful. I love the color of the wood. Your yarn is gorgeous as well! Thank you for writing up this little spinning tutorial with pics. 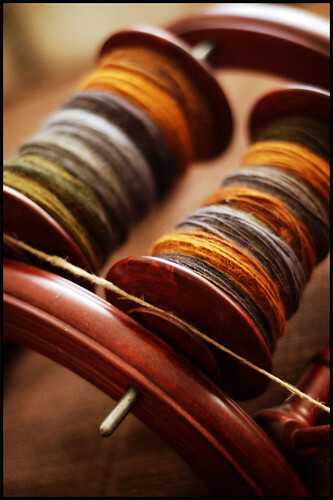 I'm signed up for spinning class this June - drop and wheel - and I can't wait! I am going to have to send a link of your blog to my mother. She used to spin a great deal. 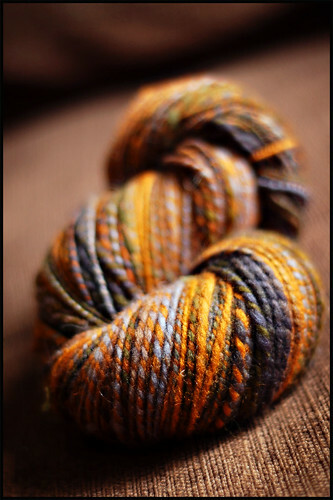 Your handspun is out-of-this world beautiful. I am so loving discovering your fantastic blog - it is going on my blogroll pronto! Thank you for adding a bit of delight to my day!